Do you plan on using our aesthetic surgery clinic in Cannes to eliminate excess fat from your body? 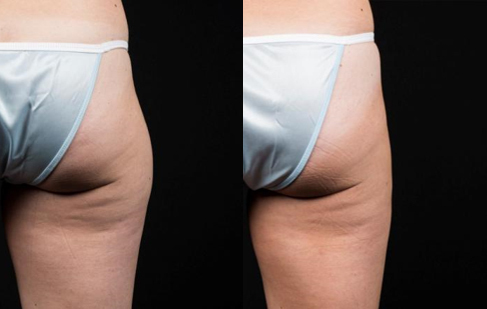 Here are a few before/after photos of our cryolipolysis procedures by Coolsculpting™, which is a non-invasive technique using a fat-freezing system. To find out more about cryolipolysis and coolsculpting techniques, please go to our dedicated page here or book an appointment directly with our aesthetic surgery clinic in Cannes. Before and after photos for cryolipolysis of the stomach using Coolsculpting™: result at 3 months. No concomitant weight loss. Flat stomach without surgery with cryolipolysis using Coolsculpting™. Result at 3 months. Concomitant weight loss of 1.8 kg. Coolsculpting™: result at 3 months. Concomitant weight loss of 2.7kg optimising the result. Cryolipolysis using Coolsculpting™ of outer thighs. Result at 3 months.